The Birgel felt jacket by Spieth & Wensky offers a classic design with a modern twist. Made from traditional grey woollen felt fabric, all kinds of charming details have been added. 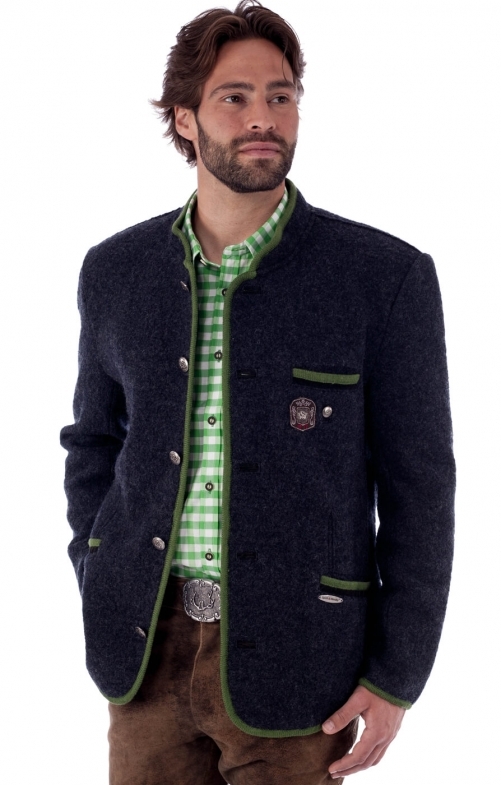 Bright green piping decorates this simply cut jacket and gives it a fresh splash of colour. The silver buttons reflect the jacket’s traditional design and feature the maker’s logo. The pockets and button holes feature khaki-coloured cord tucks, while the breast pocket sports a small yet elaborate crest design. This felt jacket can be combined with a complete folk costume or more modern clothing, giving your everyday outfits a touch of tradition and rustic chic. Sehr angenehmes Tragegefühl, auch bei etwas kühlerem Wetter noch warmhaltend. Eine Innentasche würde die Funktionalität noch erhöhen.